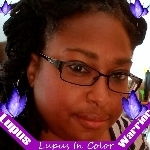 As most of you know I was diagnosed with Lupus at the age of 12. Help me and the Chapter take steps to raise money for lupus research and education programs while increasing awareness of lupus and rallying public support for those who suffer from it. With your support and involvement, we will be able to solve the cruel mystery of lupus in our lifetime and end its devastating impact on millions of lives.